Home 63 of 109 Senators From Both Parties Sign To Impeach President Jonathan? 63 of 109 Senators From Both Parties Sign To Impeach President Jonathan? 63 of 109 Senators From Both Parties Sign To Impeach President Jonathan? SIXTY-three senators as of Thursday have signed up to the plan to impeach President Goodluck Jonathan in the upper legislative chamber, The PUNCH learnt in Abuja. 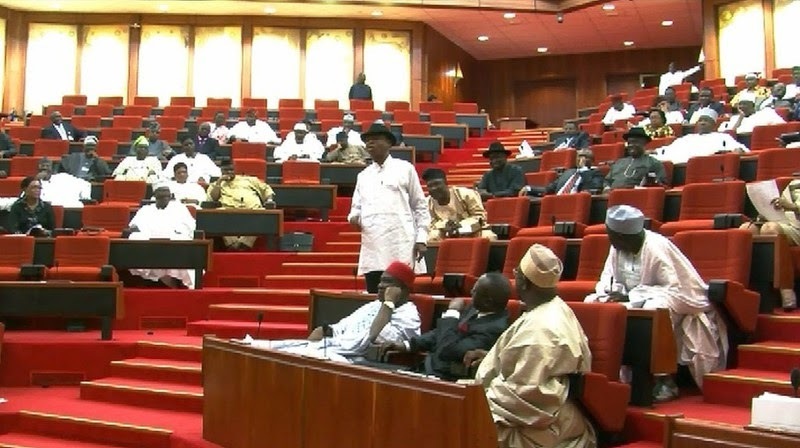 One of the arrowheads of the move to remove Jonathan in the Senate showed our correspondent the list containing the signatures of the senators. The source said eight Peoples Democratic Party senators were among the signatories to the planned impeachment notice. The senator cited poor implementation of the national budget since 2011, alleged high level of corruption and “gross disregard” of the legislature at both the federal and state levels as topping the list of lawmakers’ anger against Jonathan. It takes a 2/3rd vote to impeach the President. Impeachment is expected to commence next week. Some PDP senators have been delaying because they are interested in the appeasement offer of automatic tickets. Tags # 63 of 109 Senators From Both Parties Sign To Impeach President Jonathan? Labels: 63 of 109 Senators From Both Parties Sign To Impeach President Jonathan?